A cold miasma envelopes the house and the trees and the cars. Judge and Annie are in. Their outside business was completed quickly. They did not dawdle. The fire is doing its best. The glass is clean, more or less. The coffee is warm. Hot is a reach too far. And, I made a mistake. I have made the same mistake for years. I have misstated the year of my sewing machine’s birth. 1946, I have said. But, as the date on the manual has just informed me, is 1958. 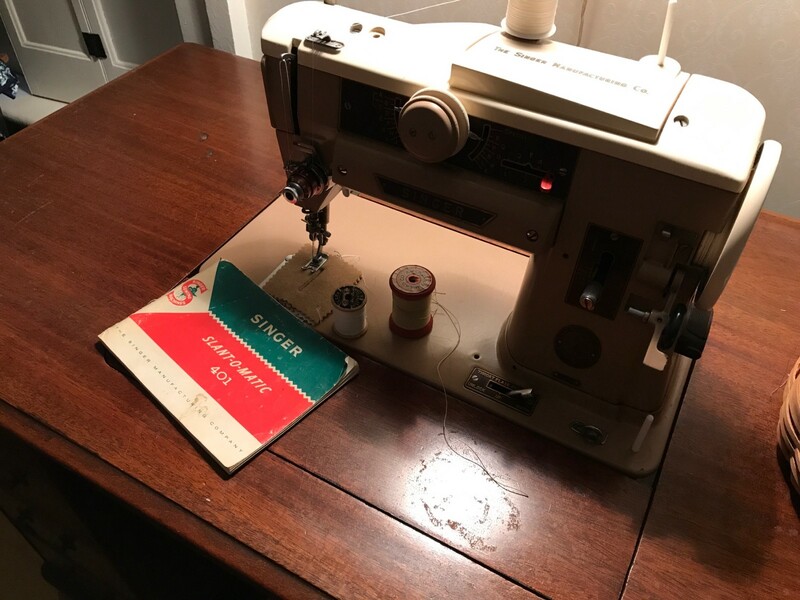 I have talked about this sewing machine, the pride and joy of my sewing room, its state of the art, its sturdiness, its pinnacle of sewing machine design, and its age, older than me, often. One could say, I have bragged. We talked about sewing machines yesterday, my friends and I. No one championed the latest model. One friend had the latest model, could not make it work, and exchanged it for an early model. Another described taking her machine in for cleaning and learning it is a valuable antique. A friend remembered staying with her grandmother. Every day her grandmother would say «You dust the treadles on the sewing machine while I take my nap» and so she would. That machine must have been in constant use, to need to be dusted every day. Or maybe the grandmother must have been in constant use, to nap every day. Sewing machine manuals obscure. They show you the intricacies of threading and oiling and cleaning and bobbin-filling. They describe the perfect stitch, and the number of adjustments to be made, tension here, tension there, screws, needles, thread. One thing wrong, and the bobbin tangles itself, the thread breaks, the material stops moving. Out comes the manual. Out comes the threading. Out comes the bobbin. The manuals show neat lines of stitching, fancy stitching, crisp hems, strong seams. A sewing project is not relaxing. The pattern lists the ‘notions’ required: thread, interfacing, zippers, buttons, bindings. The material, light, heavy, plaid, stripe, knit. The size. The suitability. Every decision fraught with disaster. Fold, pin, cut, mark. Then the question «Did you wash the fabric?» The answer «No.» The shock, the danger. SHRINK! The fabric will SHRINK! My mother said I was perfect and so I am. The fact is, my 1946 Singer was made in 1958. And I just did a bound buttonhole on it. And the coffee is good enough. And the fire is warm enough. And the grass shows green. And if you don’t agree, and you are that close, well, maybe, I will slap you!